L to R:Chaw Meng, Mrs Chaw, Mrs David, David Cheng Gim Leng, Lye Yew Seng, Lim Leh Choo, Phung Yoon Min and Yap Keing Chen. Riverfront Kuching. 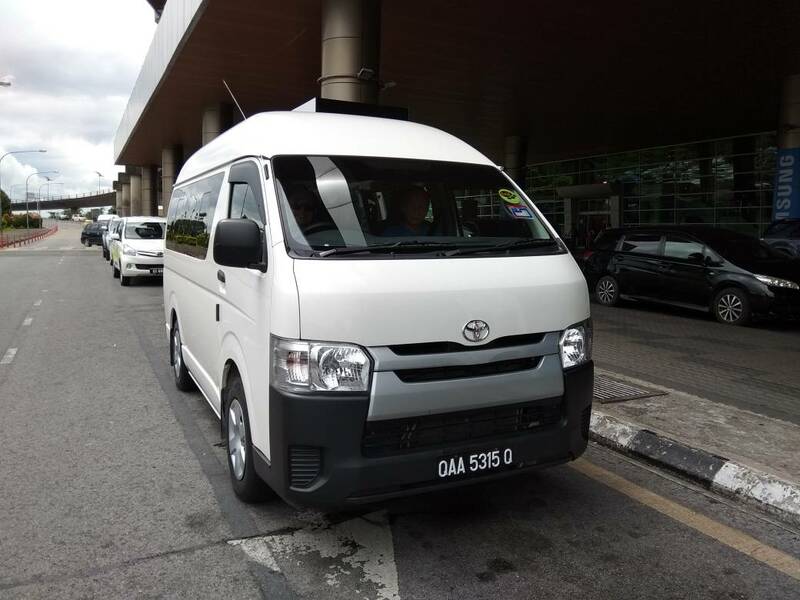 Team Trip Transport - Toyota Hiace at Kuching International Airport. 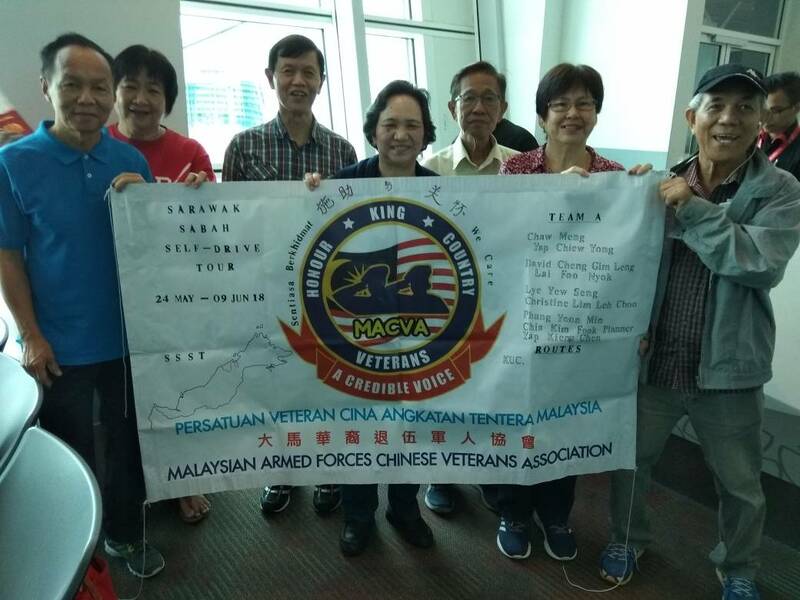 On 24 May 18 morning, Team A which comprises of 8 MACVs and spouses departed from KLIA2 and arrived safely at Kuching International Airport at 11.00 am. The Team then received the transport for their adventure trip; a white Toyota Hiace Van from the waiting transport agent. After satisfying themselves with a thorough check of the vehicle, they proceed to a City Tour of Kuching; meet up with local comrades and night stop in Kuching. This pictorial report using 133 pictures record's their journey throughout the Self Drive Tour in East Malaysia. Pre departure at KLIA2 on 24th May morning by Air Asia. Yap Keing Chen took early flight by MAS. Special Trip Banner prepared by Phung Yoon Min. First dinner at Roof Top Food Court at Kuching. Special order 'Oysters fried with eggs' like big wok. The team visited TUDM Kuching and Sarawak Cultural Village at Santubong. They enjoyed the evening scenic view of Riverside Kuching after dinner with new MACVs and night stop in Kuching. The visit to RMAF Kuching was enjoyable as well as unforgettable. The entire Team was invited for a Real Simulator Session of joy flight. Chaw Meng take on as pilot, Yap Keing Chen as co-pilot, Phung Yoon Min as Flight Engineer and all other team members as passengers. The Team took off at Kuching Runway 25; made a smooth take off and then stabilized at 1500 ft. Due to unforeseen circumstances, our pilot had to make a turn back for landing. The whole joy ride was about 6 minutes. All of us were delighted with this marvelous experience and thank you so much to the Flight Simulator Instructor who took a picture with us. At TUDM Kuching. Signatures from TUDM Kuching. Taking photo with Base Commander. Chaw Meng presenting MACVA momento to Kol Masro bin Kaliwan TUDM. Kenyalang Space Gallery. Various souvenirs displayed inside the Gallery. Indonesia transport plane. Nuri Helicopter. Taking photo with 7 Squadron personnel. Dinner fellowships with comrades in Kuching restaurant where 3 new MACVs sign up. Standing 3th from left: Beh (Army), Chuah (new MACV), Rocky Chan (new MACV), Teah YS (new MACV). Kuching Dinner fellowships. Nite Special dinner with Empurau fish order by local comrade. Yummy Big fresh fish. The Team visited some local scenes recommended by local comrades. They proceeded to Sri Aman in the afternoon and visited Fort Alice. The Team night stop in Sri Aman. Bought in Kuching white & black pepper (RM30 & RM20 per kg) from local comrade before departing to Sri Aman. Highway construction along route to Sri Aman. Highway construction along route to Sri Aman. Visited river wharp at Sri Aman where people watch Tiger Wave occurrence in certain period of the month. Lunch in Serian. Night Stop at Seri Simanggang Hotel. Buffet breakfast in Seri Simanggang Hotel. Some dishes on trays. The Team travelled to Batang Ai National Park in Lubok Antu which is situated 250 km east of Kuching for scenic lake views. The Team got side track and lost their way as WAZE cannot function in most of the locations. Luckily they were guided back to Batang Ai by a helpful local resident. After Batang Ai, they proceeded to Sibu for a City Tour in the afternoon and meet up with comrades. The Team night stop in Sibu. Group Photo at Batang Ai Lake. The Team presented MACVA Souvenir Clock to local resident in Lubok Antu in appreciation for his assistance in guiding the Team back to Batang Ai Lake after they lost track. The Team push off early on a 300 Km drive to Niah National Park . It was raining heavily and they break for lunch at Bintulu. They arrived late noon passed 6.15 pm at at Niah Village. The Team night stop at nearby hotel. Via Bintulu town. Lunch at Bintulu. Arriving late at Night Cave Motel and have local dinner. The Team visited Niah Caves. After visiting Caves, they have dinner at nearby Niah town before moving on to Miri for comrades gathering and visited the City night view. The Team night stop in Miri. The Team presented MACVA Souvenir Clock to local Chinese Association Chairman at Niah Town during breakfast get together. Main entrance to Niah Caves. River Crossing. Taking boat ride across river for Niah Caves exploration. First Cave called Trader's Cave. Second Cave called Great Cave. Lunch after visiting Niah Caves. The river have crocodiles. Do not drop in or take a swim. On route to the caves. About 90 minutes walk uphill. Last Cave called Painted Cave. The Team moved to Muara Ferry Terminal in Brunei and took a 2 hours High Speed ferry to Labuan early morning. 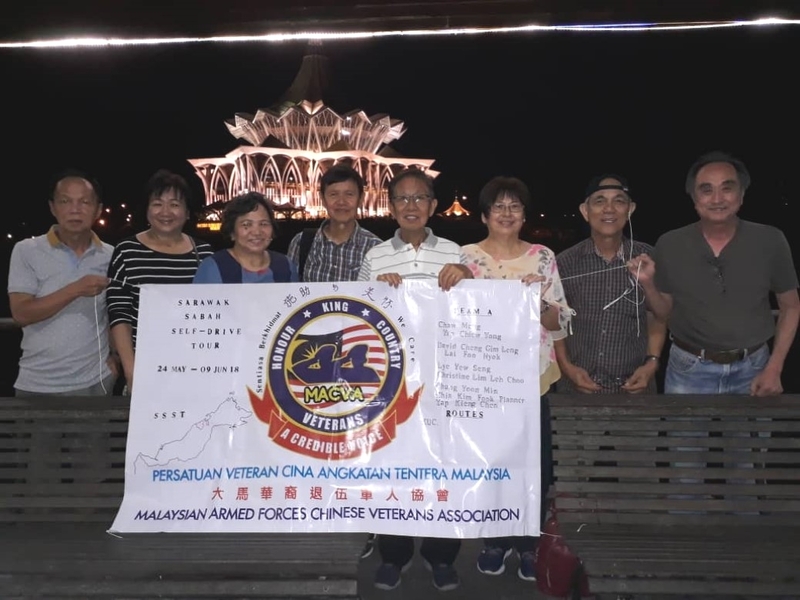 In the afternoon they visited TUDM Labuan and had a comrades gathering dinner in the evening where 3 new MACVs sign up. The Team night stop in Labuan. Muara Ferry Terminal. Group photo onboard Ferry. Toyota Hiace Van onboard High Speed Ferry. Arriving at Labuan Terminal Point. Visit C130 Hanger TUDM Labuan. Visit Heli Hanger TUDM Labuan. Presentation of momento to Base XO. 14 Squadron previous crew list. Squadron previous crew list. Teabreak in Crewroom after visiting 14 Sqn. Team Leader Chaw Meng TQ Message to CO RMAF Labuan. “Dear Dato’, Thank you very much for hosting us for the base visit. Your XO Kol Azhari received and conducted the tour. Everyone we met on the visit treated us with warmth and respect. We let the most senior in service F/Sgt Lye to present a memento to the base. At the end of the visit, 14 Skn Major Asmah hosted us to tea break despite being in the fasting month. The treatment we received certainly made us feel proud to have served the King and Country. Best regards from all of us”. Team Tour Guide Phung Yoon Min Message. “Good morning comrades, Team A is proud to announce that we had just completed half of our journey of East Malaysia; about 1360 Km after 8 days and 7 nights. We are now in Labuan and later about 11.30 am will take another ferry to proceed to Keningau in Sabah. So far all of us are quite happy on this journey especially in visiting our previous serving bases, met old comrades and tasting of foods. Umpurau, soon hock, tiger prawns, kerapu and etc. Hopefully the next half of the journey will give us more exciting and surprising views”. Comrades gathering dinner in the evening at Labuan where 3 new MACVs sign up. Seated from left: Mr Tang; New MACVs:Lim Gim Lip (2nd), Ong Chip Wan (4th) and Hoe Chai Lee (5th). Labuan dinner with new MACVs. Special dishes courtesy of Mr Tang. The Team visited Labuan Surrender Point in the morning. Later they took a Ferry to Keningau in Sabah. They visited Crocker Range Park at Keningau in the afternoon and proceeded to Tambunan. The Team night stop in Tambunan. Breakfast with noodles soup at Labuan. On Ferry to mainland at 11.30 am. Ferry passenger seating room. Arriving at Menumbok mainland. Having a break at Keningua Hill top. Dinner at Tambunan local restaurant. The Team travelled to Kota Kinabalu to meet up with comrades and had lunch. After lunch they proceeded to Kota Belud and night stop. Lunch in Kota Kinabalu with comrade Cha Ah Peng. Cha Ah Peng (3rd left) receiving MACVA gift bag in Kota Kinabalu. Mr Ong (1st left), David Cheng’s friend who kindly sponsored tasty fresh fish during lunch. The Team travelled to Kudat and along the way visited Honey Bee Farm. Later they proceeded to Tip of Borneo and to Kundasang for Mount Kinabalu scenic view. The Team night stop at Kundasang. Bee Farm in Kudat. Gombizau Bee Farm Entrance. Due to WAZE wrong info. Landed at oil palm estate road leading to Tip of Borneo. Best road all the way to Tip of Borneo. Strong wing blowing at Tip of Borneo. On the way to Kundasang. Steamboat dinner at Kundasang restaurant. Note: From Kuching to Tip of Borneo was 2030 Km (Nose of the Dog). Highlands travelled from Keningau to Kundasang was about 620 Km. Total distance from Kuching till Lahat Datu was 2830 Km. The total fuel consumption so far was about RM520. Many areas have problem with WAZE. The Team travelled to Ranau visiting the Hotspring and Hanging Rope Bridge and back to Kundasang for night stop. Visit Hotspring and Rope walk. In between Rope walk. Rope walk entrance. Desa Dairy Farm visit. Farm entrance point. Fresh milk, ice cream and cow milking. In the morning the Team travelled to Ranau for Breakfast and visited the Crocodiles Farm and Orangutan Rehabilitation Centre. They had lunch at Ranau Moonlight Restaurant owned by Mr Teo, a Johorian. He kindly included our visits into his Facebook. The Team night stop at Sandakan. Breakfast at Ranau coffee shop. Sepilok Orangutan Rehabilition Centre. Orangutan Rehabilition Centre. Lunch at Ranau Moonlight Restaurant. Mr Teo taking picture with comrades. Facebook posting. Dinner at Sandakan restaurant. Nice foods with good price. The Team travelled to Kinabatangan Wildlife Sanctuary and visited Gua Gomantong enroute. They proceeded to Lahat Datu for night stop. Breakfast at same restaurant. Seafood Hor Fan at RM11. After Lahat Datu City Visit, the Team moved on to Human Rekreasi Madai Waterfall. They had lunch at Kunak before proceeding to Semporna for night stop. Entrance to the Tower of Heaven. Tower of Heaven. First tower is 100 steps. 2nd tower is 60 steps. Highest Point in Tower. Sea View from Highest Point. Late noon Semporna. Bought fresh fish from market and wives kindly prepared dinner. Many dishes for dinner. Team having own prepared dinner. Goreng pisang. Fried fresh fish. The Team visited KD Sri Semporna at 8.30 am and was received by the Base XO Lt Cmdr Faizal RMN. Lt Cmdr Aswad RMN took over and gave the Team a briefing and a fantastic tour of the base. Many thanks to MACV First Adm Datuk Kay RMN (Rtd) for the visit arrangements. After the visit, they proceeded to Tawau for dinner and pickup Team B Guide Winston Tan at Tawau Airport. The Team night stop at Semporna. Welcome by Base XO Lt Cmdr Faizal RMN. Briefing by Lt Cmdr Aswad RMN at VIP Room. Group photo at KD Sri Semporna. Tea and mee goreng in Dining Room. Briefing at Firing Range. Safety precaution briefing by NCO Alex. Live rounds shooting with HK MF5 assault rifle. Checking targets..
Having dinner at a local restaurant in Tawau. Fish dish Another type of fish dish. Fat Puan dish. Local vegetable dish. The Team visited some small islands around Semporna. 6 members from Team B arrived at Tawau Airport at 3.00 pm today to join with Winston Tan who arrived yesterday. Unfortunately, Lee Man Tat and wife missed their Flight in KLIA2 and all other flight was fully booked until 12 Jun 18. They will join Team B on 11 Jun 18 at Sandakan Airport instead. Team B will begin their drive from Tawau to Kuching from 8 Jun 18 to 26 Jun 18; another 17D16N. Team A will be flying back to KLIA 2 tomorrow at 8.40 pm. “Good morning Bro, I’m proud to announce the SSST Team A finally completed the approximate 3330 Km journey from Kuching to Tawau. All of us are healthy and happy throughout the journey. Last night we invited Team B to attend our self-prepared dinner with 2 Kg Kerapu fish; 2 Kg Sea craps; 1 Kg Big prawns plus several dishes. The van was handover in good condition. Hopefully they will smoothly carry out their journey. A debrief was carried out by us to highlight some important points on the trip. Lastly we hope to catch up with our comrades in West Malaysia after a long trip. TQ and have a pleasant day”. Boarding boat for islands tour. One island about 45 minutes away. Another island. Pulau Sibuan is the furthest island with Army soldiers. Two 7 RAMD soldiers at Pulau Sibuan. L to R: Cpl Iskandar, Phung Yoon Min and LCpl Faizal. Preparation to return to Semporna. Team A and Team B gathering for Dinner at Semporna Home Stay. The Team proceeded to Tawau Airport by Taxi for departure to KLIA2 at 8.40 pm. Message from Phung Yoon Min. “Our last destination photo at Tawau Airport before returning to KL. All looks a bit tired but with smiling faces. I am proud to announce that we had completed and accomplished this successful ‘mission impossible trip’ with all senior comrades”. At Tawau Airport. Team brunch before leaving for airport. Team Leader Chaw Meng TQ Message. My wife and I would like to express our sincere gratitude to all of you for the enjoyable journey from Kuching to Semporna. The sightseeing and adventurous activities were all done in good spirit. The visit to the airbases have brought back fond memories and not forgetting the visit to Semporna PASKAL forward naval base where we were well received. The Navy specially treated us to a live firing. Every serving soldier needs to go for prior training before firing a live bullet. The ladies were invited but they graciously declined. The men took this rare opportunity and fired 20 rounds in assault rifle and 20 rounds in pistol. Mr Phung is the top shooter and even shot down the smallest plate at 30 meter range followed by Mr Cheng in assault rifle. The roads in East Malaysia generally need upgrading but we are save in the hand of Bro Yap, a helicopter pilot who spent 20 years flying in this remote jungle and being entertained by his many exciting accounts with the many different tribes. Not forgetting the many delicious local food especially both the river fish and sea food. Sister Christine is our tour guide who provides many off-track outings. Bro Cheng kept a detail account and being a successful investor managed to have a tidy balance at the end despite being harassed constantly for good food. My heartfelt thanks to our strategic and tactical planner Bro Chia for his well thought planning. We all have a very good adventure. Thanks to Mr Phung." MACVA is very pleased that its members are embarking on such activities which promote strong comradeship among Veterans and healthy families relationship. It also strengthens the comradeship between MACVs and Serving personnel of the Malaysian Armed Forces. MACVs are an adventurous lot and demonstrates that we are still able to go out on a long field trip. Well done to the Team for embarking on this journey and 'a feather in the cap' for MACVs. 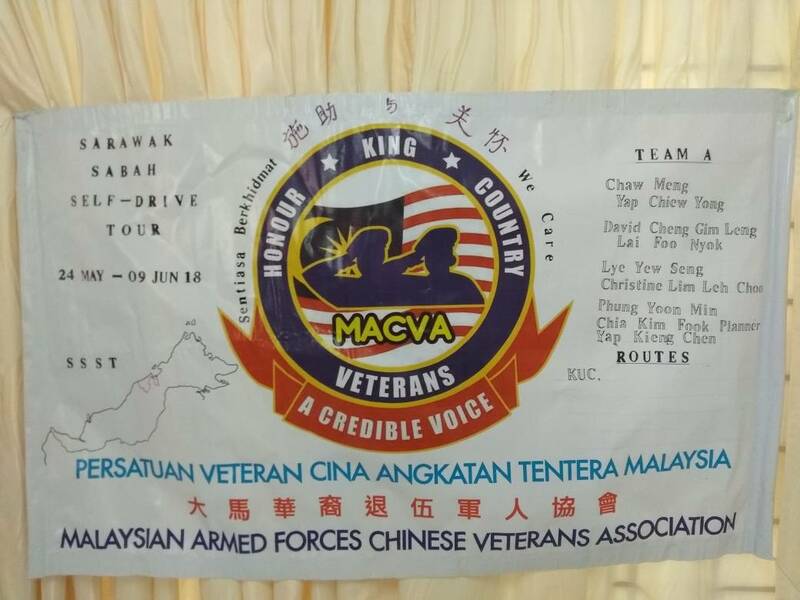 MACVA would like to extend its sincere gratitude to Royal Malaysian Air Force (RMAF) and Royal Malaysian Navy (RMN) for kindly accomodating our members MACVs during their visits while on their adventure trip to Sarawak and Sabah.